Long the bane of beekeepers, Propolis, which is most widely known for its anti-microbial properties, is now becoming widely recognized for a broader array of health and healing benefits. While employed in many different healing traditions for hundreds of years, it was used by these different cultures primarily for antimicrobial and immune related actions. Today Propolis has a growing and extensive body of research over the last 60+ years that supports it for these traditional applications as well as for a number of new promising uses. But, it is not without good reason that it was first known for its germ fighting talents. • Hippocrates, the founder of modern medicine, utilized Propolis to treat sores and ulcers. • While in China during the Ming Dynasty, Propolis was used to treat toothaches and bacterial infections. • Roman legionnaires carried Propolis with them in their “first aid” pouches. • The Incas utilized Propolis for reducing a fever. One of these invaders that virtually every one of us has had to deal with is a virus. Propolis brings to the table a number of antiviral specific actions that include reducing the viral load, blocking viral DNA synthesis, inhibiting infectious activity, slowing viral activation, and preventing the virus from entering a host cell. Its antiviral properties have been tested against influenza A and B, herpes, HPV, H1N1, and even polio. One study found that Propolis decreased mortality and increased survival time when infected with a deadly influenza. Bacteria are also susceptible to the actions of Propolis. It inhibits bacterial cell division, destroys the cell structure of the bacteria, and causes bacterial destruction. These antibacterial actions have been well researched dating back to the 1940s where it was tested against strep and typhoid infections. Later, in the 1960s, it was tested against different bacterial strains and found to strongly inhibit 25 of 39 types of bacteria. A 1985 study looked at 75 different bacterial strains, 69 of which were strep, and found all were highly sensitive to Propolis. In a more recent study Propolis was active against 15 MRSA strains. Many of us are aware, more and more bacteria are becoming antibiotic resistant. As an adjunct therapy with antibiotic use, Propolis can make some antibiotics more effective while reducing the likelihood of antibiotic resistance developing. As many of nature’s powerful healing allies do, Propolis offers its healing gifts in a holistic manner. While the antimicrobial actions of Propolis are profound and effective it also works by supporting our body’s own natural defense system. Propolis is a potent immune modulator that enhances immune system activity, decreases inflammation, increases antibody production, activates macrophage, and increases cancer scavenging NK cells. As I imagine many of you are already aware, our bodies are under constant stress from a range of toxins, from the air we breathe, to the water we drink, and even the food we eat; all of which tax and strain our liver. Here too, Propolis comes to our aid. 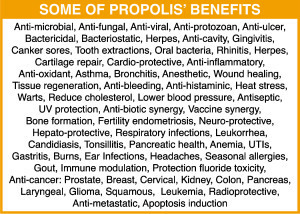 A powerful, not-well-known non-antimicrobial application of Propolis is found in Propolis’ liver protecting abilities. These include restoring healthy levels of liver enzymes, decreasing free radicals in the liver – doubly important in the liver since it is responsible for detoxifying and removing deadly free radical producing toxins from the body, improving liver cell viability, lowering liver triglyceride levels, reducing lipid peroxidation, and boosting levels of the body’s most powerful endogenous antioxidant, a.k.a. glutathione. Propolis has demonstrated its hepato-protective actions against several different types of toxins, including alcohol and heavy metals. For example, Propolis has been found to be protective against the toxicity of mercury, one of the most dangerous toxins that our body has to deal with on a regular basis, albeit from seafood or amalgam fillings or in the vaccines we are given. Propolis was found equally or more effective than silymarin, an active compound found in milk thistle, in supporting liver health as measured by several parameters. 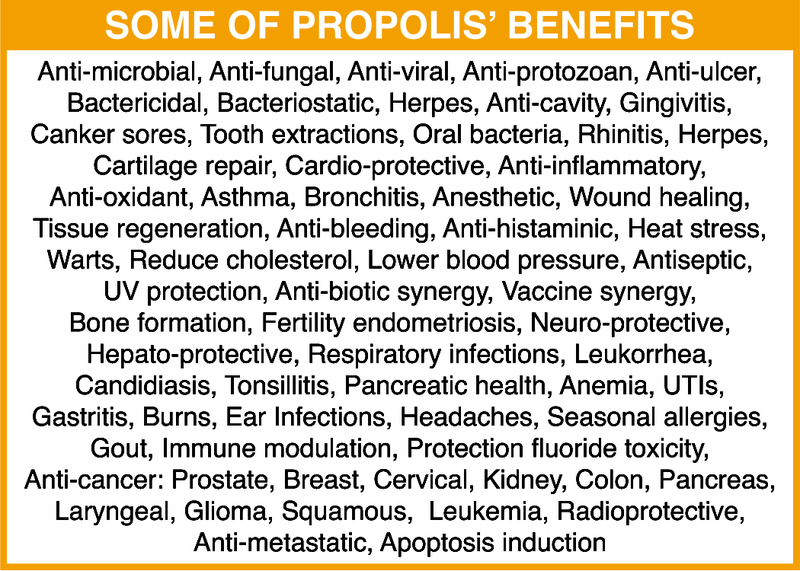 While the above information alone makes Propolis a powerful healing ally there is still so much more to its healing gifts (see chart at bottom).